Football season is over so why not start a new project? This idea came about when I saw just how amazing the full packer brisket is. I’ve been smoking brisket flats which turn out great but they just aren’t the same as the full packer brisket. However, there is one small problem with using such a big cut of meat. A full packer brisket won’t fit on my 18.5 inch Weber Smokey Mountain! 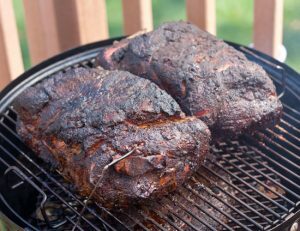 To remedy this, there are many ideas circulating the web such as propping the brisket up on a soda can, bending it, or forcing it into the WSM. I’ve also heard some ideas where you separate the point and the flat PRIOR to cooking. Well none of these options are good enough for me. The only solution was to buy a new smoker! 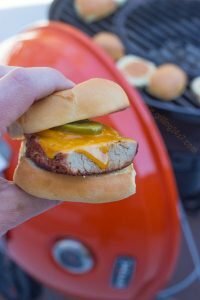 I was shopping around for smokers and the only thing in my budget was the 22 inch WSM for about $400. 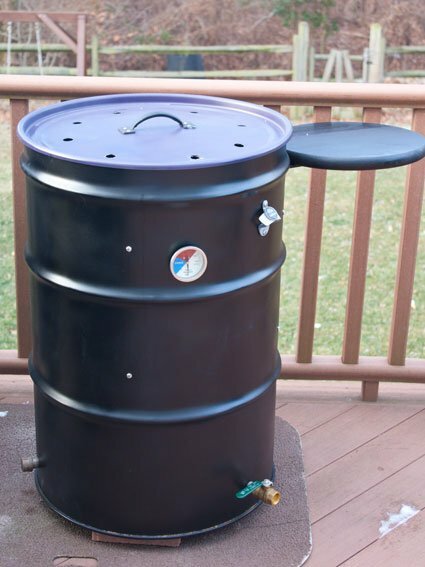 I posted this on twitter, something along the lines of, “OK, I’m buying a new smoker – I must fit a packer brisket in!” One of my followers responded, “why don’t you build an Ugly Drum Smoker! ?” I googled it for a few days and it was settled. I had my plan; I was going to build a smoker. Best of all this only cost about $220! 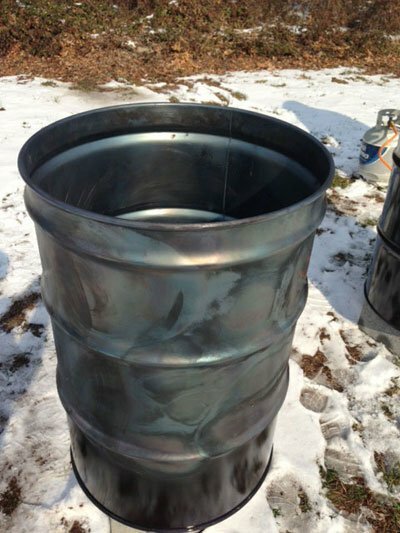 1 – Selecting and burning the 55 gallon drum. 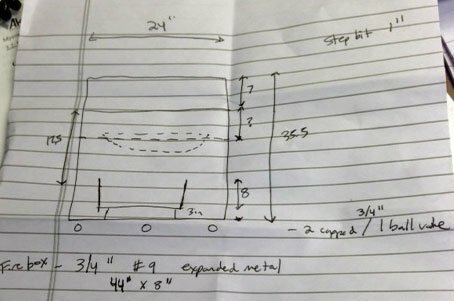 2 – Building the no weld charcoal basket. 3 – Drilling holes, hardware, assembly, and painting the UDS. I’ll also post my UDS Hardware List. Hopefully if you read all of this you will be inclined to start your own project and build a UDS! 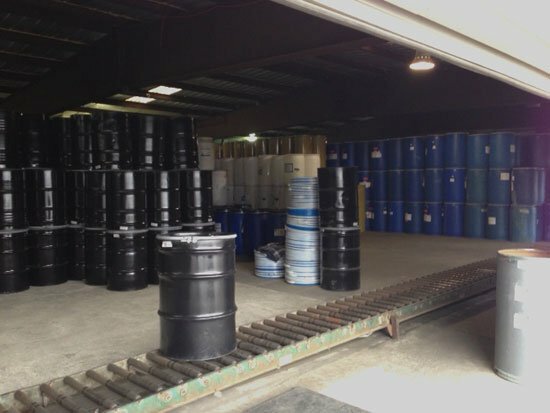 In case you aren’t familiar, the general plan for a UDS is as follows: a 55 gallon drum is positioned vertically. There are holes drilled in the sides to allow a standard 22 inch grill grate to sit nicely inside. The lid of the drum, which is removable, has exhaust holes in it. 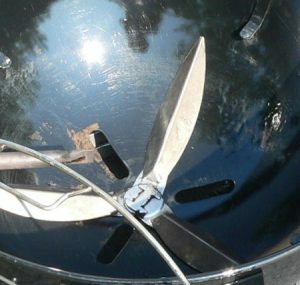 A pretty easy to build charcoal basket is placed in the bottom of the drum. Air inlets are drilled into the bottom of the drum and are controlled by plumbing valves. It’s simply a work of art! Most of the time when an old ugly drum is used the name Ugly Drum Smoker is more appropriate. When guys get fancy the smokers look really awesome and are in no way ugly! The first thing I did was to search for a 55 gallon drum. This was quite troubling. Most people online end up finding either free drums or drums for $5 at local stores. Well I called a few placed in the Baltimore/DC area and they responded like I was nuts. I gave up quickly on the search for a “free” drum. Moreover, there are a lot of issues that come into place when selecting a drum. Most free drums end up having liners on the inside. On BBQ discussion forums these are sometimes referred to as “dreaded liners.” They are made from an epoxy which is extremely difficult to remove. High heat and hours of scrubbing are required to remove the liner. This didn’t sound fun to me so I narrowed my search to unlined drums. I called a few places around where I live. One company sold “reconditioned” drums for about $35. The lady on the phone said something like, “oh yes, I think these are unlined.” Hmmm. This didn’t sound to certain. 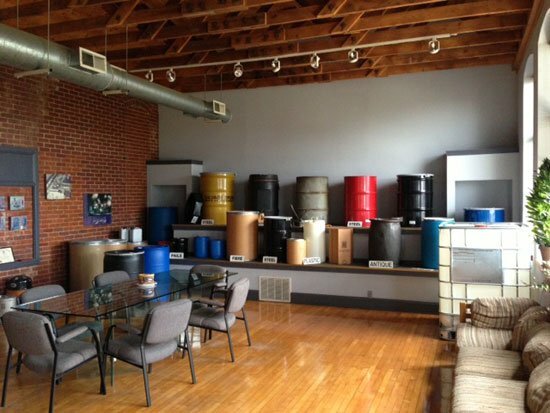 I then found a local company in Baltimore that sells 55 gallon drums called Abbey Drum. The guy I spoke with said that for smoker purposes he will only sell me a new unlined drum. This seemed to solve all my problems. Abbey Drum had a new unlined drum which wouldn’t need any horrible scrubbing or large bonfires to get out any hazardous materials that might have been on the inside of the drum. 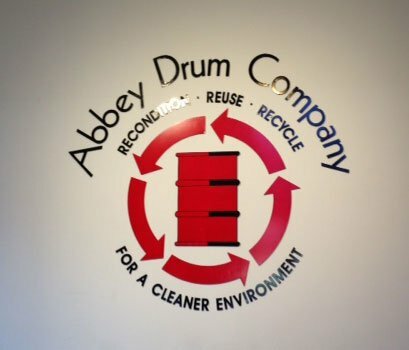 So for $74 each (including tax) I went down to Abbey Drum and bought a drum, two of them in fact! This was a pretty cool trip. I ended up in the southeast part of Baltimore city where it is primarily shipping and manufacturing companies. Large trucks were entering and leaving with huge metal scraps and random other items. I thought the entrance to the drum company was pretty cool. It looked like a drum museum. They had new drums and older “historic” versions on display. This place sells a lot of drums. 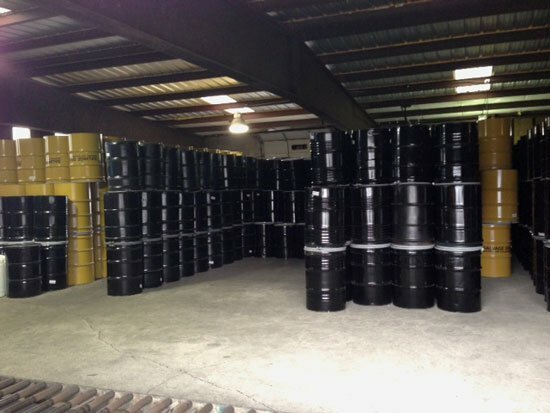 It was a little awkward when the workers found out I only wanted two drums. They are used to purchases that fill entire tractor trailers. 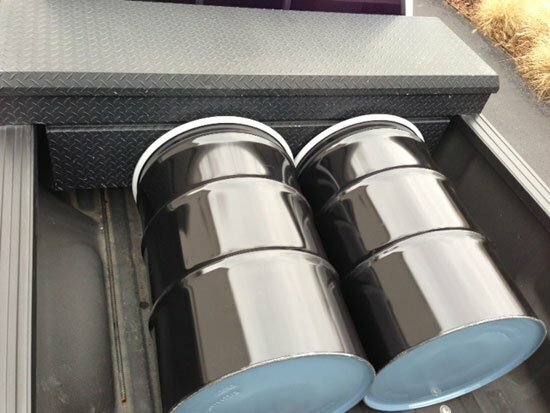 My drums came out and they loaded them in the back of my friends pickup truck. Off we went. I unloaded the new unlined drums into my garage and went about my normal business for a week. After a week or so I looked inside the drum and my first thought was how pretty and smooth the inside of this drum was. This was a little troubling because the guy at Abbey Drum told me that there was no lining and nothing inside the drum. Shouldn’t plain steel rust in a moist garage for a week? I suspected something must be on the inside. Perhaps this was a misunderstanding on my part. After a little research (me randomly calling about 20 drum supply companies across the country) I learned that unlined drums actually have a rust inhibitor on the inside. This is why the drum has this shiny gloss to the inside. Well this sucked. Here I spent the extra money to have a new unlined drum. The idea was that it was unlined so I didn’t have to work too hard to remove any interior chemicals which wouldn’t be food safe. Now I see that there is a rust inhibitor on the inside! In my mind this is a non food safe chemical lining. I can’t really blame Abbey Drum for this little hiccup. If I would have known more about the insides of the drum I could have avoided this. 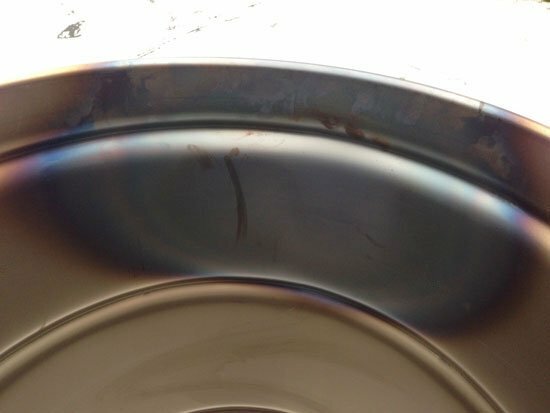 Most guys on the BBQ forums don’t have to worry about rust inhibitors because they buy old reconditioned lined drums and do a full burnout. In order to removed the “dreaded red lining” they build large bonfires with pallets of wood that last hours and hours. This wasn’t an option where I live. My neighbors are cranky and nosy and I was certain I would have had the fire marshal at my house after 15 min! A few more days of research and I ended up talking to a head engineer at a drum company in the Midwest. He was a nice guy and explained everything to me. He explained that the rust inhibitor is usually a variety of clear alkyl paints. These paints and most linings are cured at about 500 degrees. If the curing takes place at 500 degrees then the 1000 degree flame from a propane weed burner should easily remove the rust inhibitor. Great. 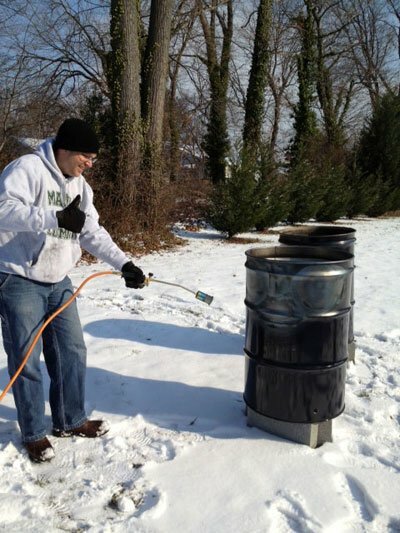 Nothing like using a flame thrower on a steel barrel in the middle of the winter! My project now required me to order the cheapest propane weed burner that I could find on Amazon. It was about $14. If you look at the photo above you can see that after about 2 minutes of flame being applied to the OUTSIDE of the drum that the interior rust inhibitor came right off! So my buddy and I spent a Saturday and burnt two 55 gallon drums with a propane weed burner. It took about 3 hours to get the exterior paint off and also the corresponding rust inhibitor. It’s worth noting that the interior rust inhibitor did come off with the flame being applied to the exterior of the drum. It appeared that the amount of time required to burn the exterior paint off was more than enough to remove the rust inhibitor. I used a laser thermometer on the inside of the drum while the flame was being applied to the outside and it easily reached over 1000 degrees. out procedure went while using a propane weed burner. There we have it. A paint and rust inhibitor free 55 gallon drum ready to be turned into a smoker. Above is the general hand written plan I followed. It gives a very rough idea of where the grates are placed and how the charcoal basket will look. Generally, the highest grate is 7 inches from the top. The charcoal basket sits on 3 inch legs and is 8 or 9 inches tall. Somewhere in the middle I wanted an additional grate which could be used for a heat diffuser or a possible water pan. This is roughly shown on the above plan. Next post I’ll discuss how to make the charcoal basket. Very Nice … Excellent !!! Love this”great idea 4a smoker less than buying one! Hi mates, itѕ wondｅrful paragraph regarding cultureand comⲣletely explained, keeρ it up all the time.